Sarasota, FL — ShelterBox, the international disaster relief organization, urges holiday shoppers to think globally this season and give a gift that will provide help and hope to those in crisis. While a mosquito net and a filter to access clean water are not likely on most gift lists, these emergency essentials, along with much-needed supplies packaged in a green box, a ShelterBox, are lifesavers for disaster survivors. The answer is the ShelterBox which is filled with critical supplies, including a durable, custom-designed tent for shelter, thermal blankets, groundsheets, mosquito nets and a water storage and purification system to protect families from disease, solar lamps, a tool kit to repair their home, cooking and eating utensils, gloves and hats for warmth and a children’s activity packet. “We provide families with not only the basic essentials to survive and rebuild during their time of greatest need, but we also give them a new home, as well as hope and dignity,” added Sperling. ShelterBox is an international humanitarian relief charity that delivers emergency shelter and supplies to people who lose their homes after a disaster such as a flood, hurricane, volcano, tsunami, cyclone or earthquake. 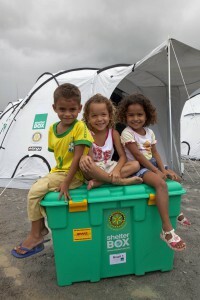 ShelterBox also provides assistance in war-torn countries and other areas faced with conflict. In addition to providing ShelterBoxes, the organization also responds to specific relief needs depending on the type and scale of a disaster—by providing large quantities of tents or water filters for example — whatever the crisis situation requires. Since its founding in 2000, ShelterBox has responded to over 240 disasters in more than 90 countries and provided emergency aid for well over one million people. During the Haiti earthquake in 2010, ShelterBox mobilized quickly to bring nearly 30,000 ShelterBoxes to survivors, aiding one-third of a million people. ShelterBox is made possible through donations from generous people and organizations. Reports indicate as many as 3,000 people die every day from malaria around the world. A $35 donation to ShelterBox can provide mosquito netting to help protect families from this life-threatening disease. A $100 gift can provide families with access to clean water. “The holiday season is a time to count our blessings and make a difference,” said Sperling. “You can make a donation in honor of a friend or loved one and send a personalized card about the gift made on his or her behalf.” The gift is tax deductible to the extent permitted by law. ShelterBox USA is a 501(c)3 nonprofit organization. To choose a gift to help a family in need this season, visit www.shelterboxusa.org/globalgifts. Donations can also be made at www.shelterboxusa.org/donate, by calling (941) 907-6036, or by texting “SHELTER” to 20222 to make a one-time $10 gift.